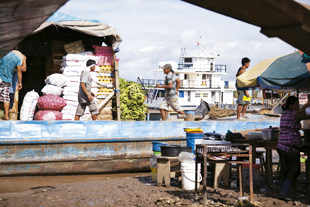 The current Port Terminal of Yurimaguas, administered by the National Port Company (ENAPU), is located on the left bank of the Huallaga River, adjacent to the city of Yurimaguas, and started operations in March of 1981. 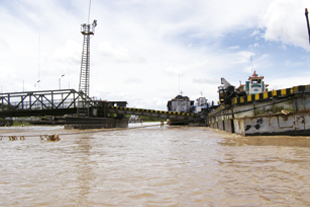 The current river infrastructure of the ENAPU Port Terminal consists of a 66 m long and 6.10 m wide floating dock, and a 33.03 m long and 7.3 m wide bascule bridge. These installations only allow berthing of 50 to 60 m long pontoons or barges, whose size and design restrict proper maneuvering due to lack of space, operative capacity and adequate port equipment to provide for the corresponding cargo services. This situation has led to the existence of informal piers adjacent to the ENAPU Port Terminal: La Boca, Zamora, Abel Guerra, La Ramada, along the Paranapura river, that concentrate the unattended services by the ENAPU-Yurimaguas Port Terminal. The activities of these informal piers originate cost overruns, shortages and insecurity for the dockworker, the ship, the loading and unloading of cargo operations, for the passengers themselves and harm the environment. The concession of the New Yurimaguas Port Terminal is a response to this inconvenient and insecure situation. On December 29, 2009, PROINVERSIÓN called an international tender for the concession of TPY-NR. The award was granted on April 27, 2011, to the company Concesionaria Puerto Amazonas S.A., and the contract was signed on May 31, 2011, in the city of Yurimaguas.